Where team spirit is a way of life. Posted in Printables, University of Georgia	by Victoria H.
I’ve received numerous requests for a UGA PDF of the schedule so here it is! The PDF printable football schedules are great for hanging on your fridge, in your dorm or even in your cubicle at work! Choose the circus stripes, polka dots or the chevron background. Enjoy! Click the link below to download the PDF. Click here to download the polka dot printable PDF for UGA. Click here to download the chevron UGA PDF. 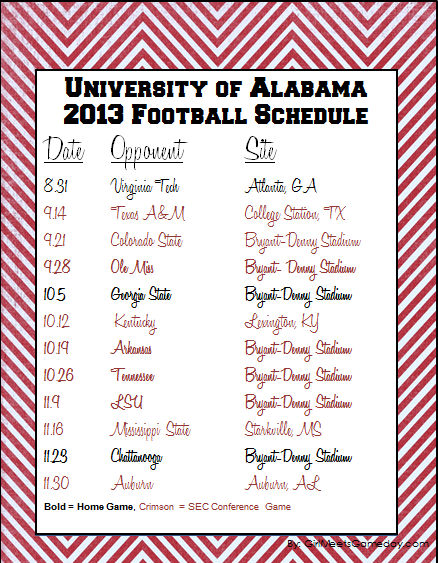 Posted in Printables, Uncategorized, University of Alabama	by Victoria H.
I’ve gotten several requests to update this printable, so I’ve added the 9/21/13 game to my printable PDF. When I originally created the first post (5 or 6 months ago) the Colorado State game was not listed online for some reason. Well…wait no more here’s the updated version! Enjoy!